In this project I explored different aspects of cartography. Below are some of my samples and my final pieces, which were exhibited in the MART gallery, Rathmines, Dublin. The fabric squares in this series of pieces are made from recycled t-shirts that I hand dyed colours of an Irish ordinance survey map. Conceptually, I liked the way used garments fitted into my mapping work as they are part of a worldwide industry and the garments I used likely traveled through multiple counties before arriving in my possession. Layering became important in my work as I learned that 2D maps are formed in layers, concentrating on one element at a time, for example, elevation of land, then land use, then roads. It is a culmination of layers of separate information that form a map. The layering also relates to strata – the sediment, rock and soil that creates the earths surface. Having the fabric cut in 10x10cm squares relates to the land that is represented in a map being bound by a grid structure. 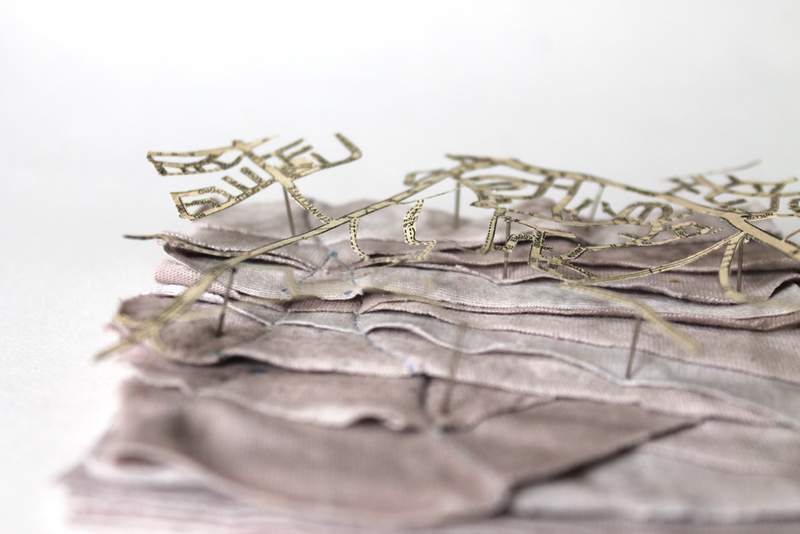 In some of the pieces in the series there are shadows cast by a skeletal road map balancing on the top of the fabric. This alludes to the ephemerality of mapping, the fact that everything is constantly changing and the impossibility of a true representation of our world. I also used pins throughout the series. I used the pins as a tool for expressing journeys and markings within the series. Pins, for me, have a close relationship with maps; I will always want to mark in where I have been in the world with a pin.